Marc is a REALTOR with #1 Properties, a leader in the Cheyenne real estate community. Marc acquired his real estate license in 1996 and has proven his dedication, honesty, integrity and knowledge to his clients and customers. 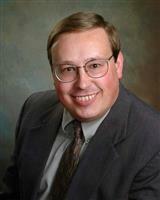 Marc was chosen by his peers as the Cheyenne Board of REALTORS 2004 REALTOR of the Year. Marc has earned his CRS (Certified Residential Specialist) designation. To earn the Certified Residential Specialist (CRS) Designation, every REALTOR must have significant experience and demonstrate volume of real estate transactions or gross sales, as well as complete rigorous educational requirements. Every CRS designee is required to maintain membership in the National Association of Realtors and to abide by its strict code of Ethics. Marc has earned his e-PRO certification The e-PRO Internet Professional certification program is a new training course developed for all real estate professionals who are members of the National Association of REALTORS. The coursework for this certification is conducted entirely online. Once completed, the e-PRO certified real estate professional joins the ranks of a special community of highly skilled and continuously trained professionals who provide high quality and innovative online-based real estate services Now consumers can identify the e-PRO through the exclusive e-PRO Internet Professional logo. Marc has completed the real estate industry's most comprehensive new home sales course to earn his national designation as a Certified New Home Specialist. With this designation, he joins a group of the most successful and highly-respected individuals in the profession of real estate. This course is recognized as one of the very best ever offered in real estate. The training covered architectural design and planning, blueprint reading, topography, building site design, evaluating quality construction, materials, methods, construction terminology and scheduling Studies also included successful buyer/builder relations, all aspects of customer service and the use of various organizational tools and systems He is able to do a much better job of assisting anyone interested in a brand new or existing home. 2016 marks a milestone in Marc’s career. He has been a license real estate agent for the past 20 years and if very excited to have his Daughter, Erin Gilmartin, join him in his real estate practice. Together they have created The Dempsey Gilmartin Team and look forward to working with you on your next real estate transaction. Marc and Erin are ready to assist you with all your real estate needs. With experience in rural residential, single family, multi-family, townhomes, condominium, and new home construction Marc and Erin can handle your every need. Call us today! It will be the best phone call you make.